Good Morning Traders~! ECB meeting can lead to one of the more volatile days in the currencies and interest rate markets. The chart of the EC above shows how it is right in the middle of a trading range – the lines mark off the most visible chart points. Impossible to predict in advance which way it will break and often it can break in one direction and then come out the other direction. Bunds are poised for good move – a reaction up will be a shorting opportunity and if they take out Wednesday’s low of 144.38, 144.18 is the next pivot down to play for. Bonds are forming a bearish consolidation on the 240 minute chart. 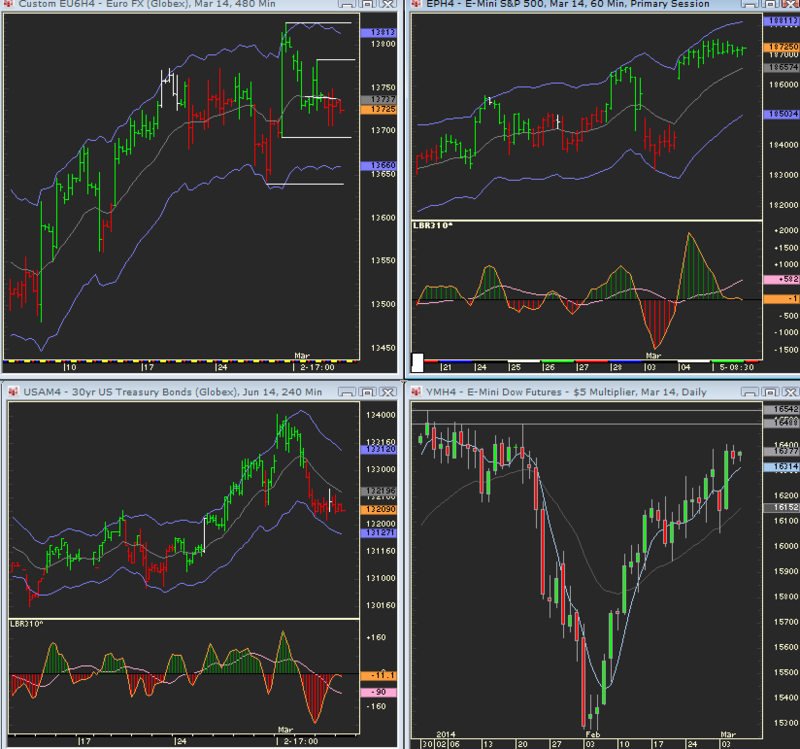 Indexes consolidated to their 30 minute EMAs. The hourlies are poised to turn back up. Again, ECB day CAN result in fluctuations in both directions off Draghi speaking. If the market turns higher, there are still key pivots in the DOW that come into play to the upside. Breakout Mode in $, GC, SI and NR7s in multiple markets (except hogs and coffee – silly joke).